Todd Agnew's poignant songwriting takes a more musically eclectic direction with this album. Todd wrestles with the idea that our questioning does not minimise our experience of God, rather enhances our relationship with Him. 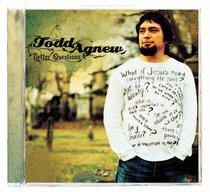 :Todd Agnew's poignant songwriting takes a more musically eclectic direction with this album. Todd wrestles with the idea that our questioning does not minimise our experience of God, rather enhances our relationship with Him. Customer Reviews For "Better Questions"
Todd Agnew's newest offering, Better Questions is a journey through those subjects so many of us ponder - either superficially or at a much deeper level. He has dared to broach such subjects as divorce, the Christian superiority complex and obedience. The stand-out track for me is "If You Wanted Me". It explores the struggle of being merely human and striving to imitate Christ. And let's be honest, that's not always an easy task. This album does not declare to have all the answers and neither does Todd. It's an acknowledgement that questions are natural and when we treat them correctly, they help us grow. Muscially the album is diverse - from the rocky "Least Of These" to the almost reggae beats of "Peace on Earth", the stand-out ballad "If You Wanted Me", the new interpretation of Rich Mullin's "Be With You" and the epic "Martyr's Song". If you are an Agnew fan, this will be another gem for the collection. If you've never listened to Todd, give it a try and walk the journey. If nothing else, know that you're not alone in your questions and wonderings. Don't miss the hidden track! Glorious!